Cofounder of the international beauty company Caudalíe shares the simple, natural, time-tested beauty secrets she learned growing up in France that any woman can use to look younger, healthier, and more radiant without harsh products or drastic procedures. When Mathilde Thomas moved from her native France to the United States to expand her skin-care company, Caudalíe, she wanted to find out what American women wanted from their beauty routines. She interviewed thousands of women and was struck by how different the French and American approaches to beauty were. American women are all about the quick fix—the elusive product or procedure that will instantly solve a nagging beauty problem, even if it hurts, is wildly expensive, or is damaging in the long term. The French, by contrast, approach beauty as an essential and pleasurable part of the day, a lifelong and active investment that makes you look and feel good. Mathilde used these insights to turn Caudalíe into one of America’s top beauty brands. Drawing on her company’s twenty years of scientific skin-care expertise backed by the research of doctors and dermatologists—as well as the beauty secrets she learned growing up on a vineyard in Bordeaux—The French Beauty Solution covers everything from how to use natural ingredients such as oil and honey to wash your face; what foods to eat for healthier hair, skin, and nails; and the amazing properties of grapes and grapeseed oil. She also introduces an easy three-day grape cleanse that European aristocrats have been using to detox for hundreds of years. 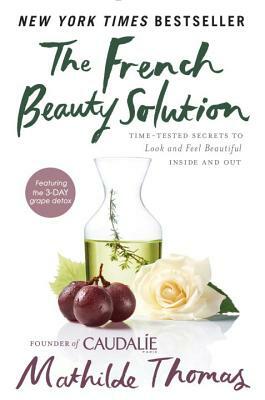 Blending stories, science, DIY recipes, and tons of savoir faire, The French Beauty Solution is the last beauty regimen you’ll ever need. Mathilde Thomas cofounded the all-natural skin-care line Caudalíe with her husband after taking inspiration in the power of grapes from her parents’ Bordeaux vineyard. Her company’s products are available in more than fifteen thousand stores worldwide. Mathilde now lives in New York City with her family, where she heads Caudalíe USA.